The fastest and easiest way to reach the Kurdistan Region from Europe is by plane. There are two airports, Erbil International Airport and Sulaimani International Airport. Austrian Airlines offers a direct flight from Vienna to Erbil several times a week, with an approximate three and a half hour duration. It is generally also possible to reach the Kurdistan Region by land via Turkey, however, because of the current refugee flows as a result of the crisis in Iraq and Syria, this is not recommendable. 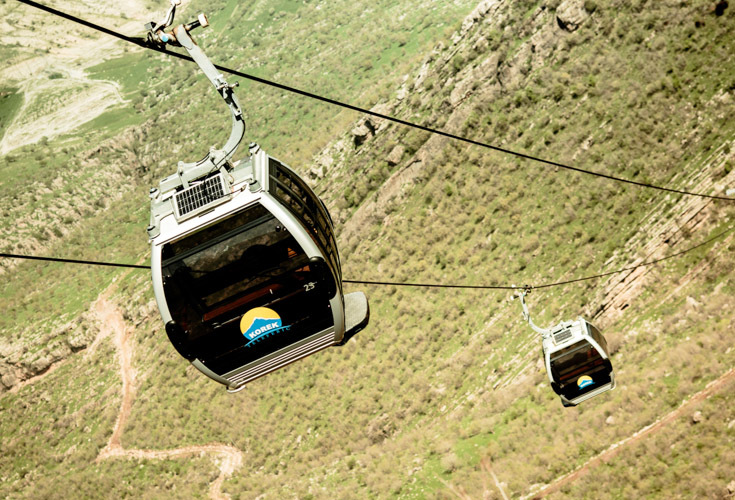 The most reliable and common way of transportation in the Kurdistan Region is by car. It is recommended to hire a driver, which also has the advantage that he will know the Region and speak the local language. A more inexpensive option is taking a taxi, which can also be shared by several travellers. With the rise of the business and tourist industries, several hotels have opened in the last few years, ranging from five and four-star accommodation to more inexpensive options. For a selection of available hotels and accommodation in Erbil, Duhok and Sulaimani, please refer to the official travel factsheet of the KRG. Cash is the only method of payment in the majority of shops, hotels and restaurants. There are ATMs in the region, but access to them is not widely available yet. The local currency is Iraqi Dinars. American Dollars are often accepted as well. Travellers can find various exchange facilities at the airport, international hotels and exchange offices. There are also many travel companies that specialise in tourism in the Kurdistan Region of Iraq, who organize tours and transportation for visitors. A list of these companies can be found in the official travel factsheet of the KRG. Before planning a business trip to the Kurdistan Region, we recommend you to consult your respective KRG Representation. They can support you in the organisation of your trip, but also arrange meetings with relevant companies and institutions, help you to establish contacts and provide further information. EU citizens who directly travel to Kurdistan will automatically receive a residence permit for 15 days issued by the local authorities. In order to travel to other parts of Iraq, it is necessary to apply for a visa at the Iraqi embassy prior to departure.